While I love all types of cooking, there is something about baking that just really does it for me! Maybe its the sugar, the butter, or the chocolate, or all three, but I love baking! I feel that I have finally baked enough to be able to experiment a bit. I’ve slowly learned the properties of baking and what makes things work, so last night I tried my first experiement, and let me tell you it was delicious! Now there’s always room for improvement, so I will definitely keep experimenting, but this sure was a good start! When I was deiciding what my first experiment would be I was torn between bread and cookies. I mean how could you not be torn between those two, right! One of my favorite things in the whole world is banana bread, but whenever I bake it I always end up eating half the whole thing by myself! 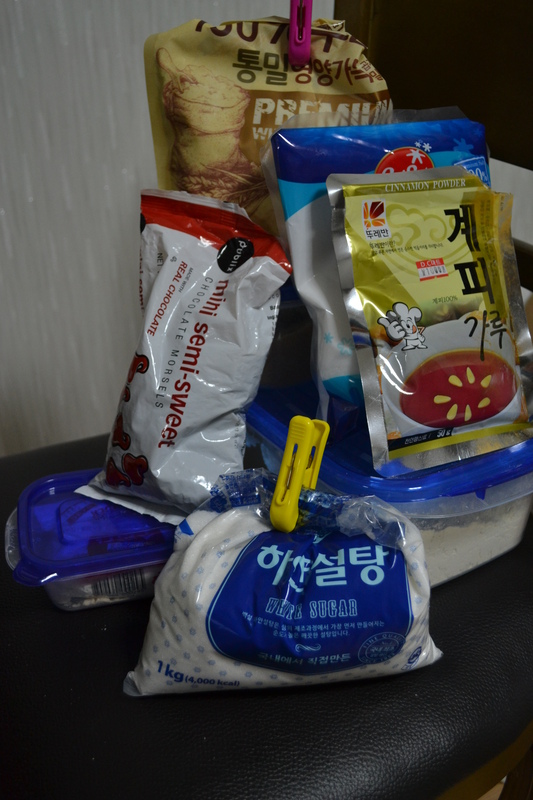 And while mini loaves are a great invention they just don’t exist in Korea- plus we all know that’s not enough bread! That where my love for cookies comes in- I love that I can make a whole batch of dough and make just a few cookies at a time and eat freeze the rest of the dough! 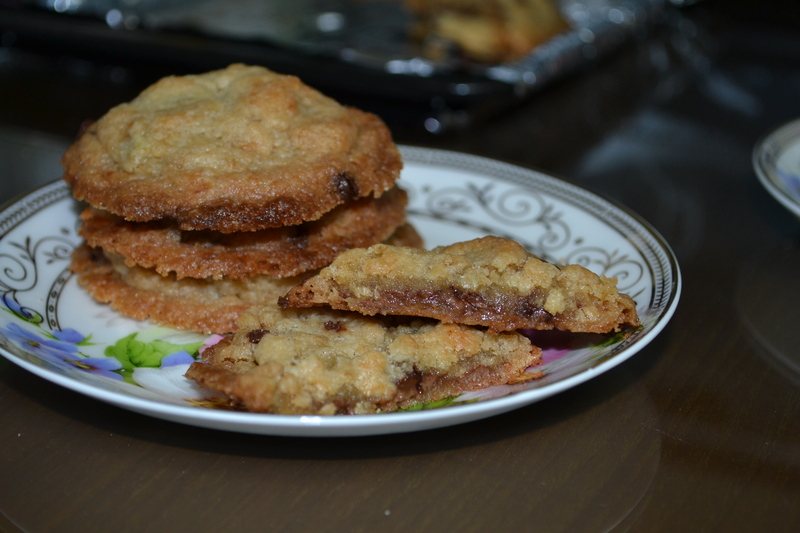 Then came my inspiration, why don’t I make banana bread flavored cookies! This is an especially great recipe for me because in Korea you can only buy what seems like 20 bananas at a time! There is no create your own amount, so we always have pleanty of bananas on hand! This is an especially great recipe for me because in Korea you can only buy what seems like 20 bananas at a time! There is no create your own amount, so we always have pleanty of bananas on hand! After revealing in my genius, I got to work! These are my dry ingredients (excuse the background- I have no counter space, remember?) 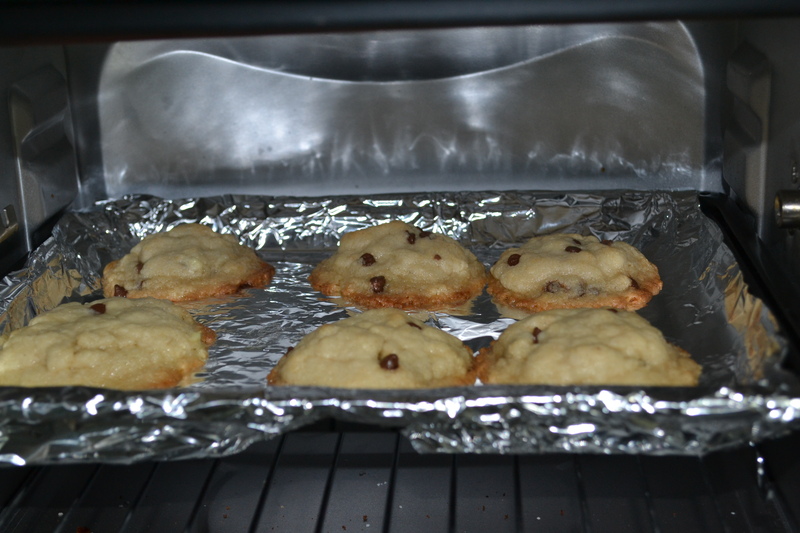 Whole wheat flour, white flour, white sugar, brown sugar, salt, baking powder, cinamon, and of course, chocolate chips! In addition to these ingredients, I had butter, of course, olive oil, and 1 banana. 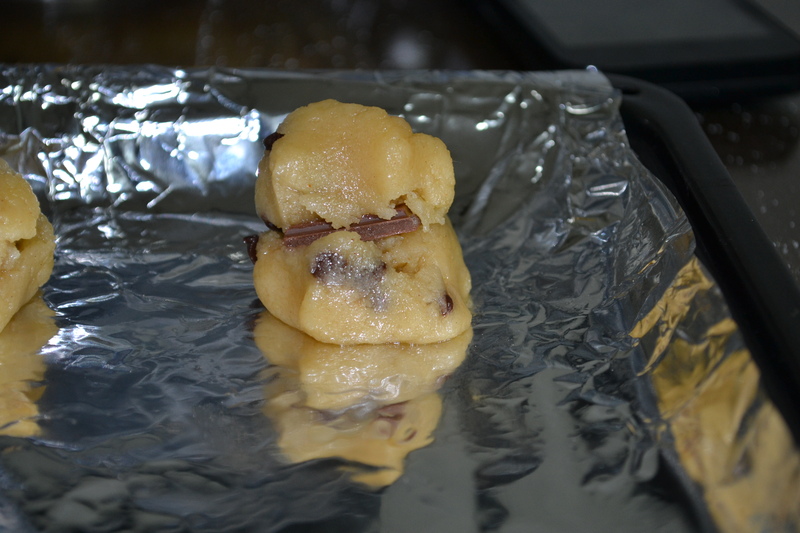 Once they started to bake the two bits of dough surrounded the chocolate piece so it was perfectly nestled and melted inside the cookie- hence the surprise! Next time I’ll probably add a second layer of chocolate in the middle, because who doesn’t want more of a chocolate suprise, right! Here’s the current recipe below, I’ll let you know how I tweak it. Feel free to share your changes in the comments below as well!